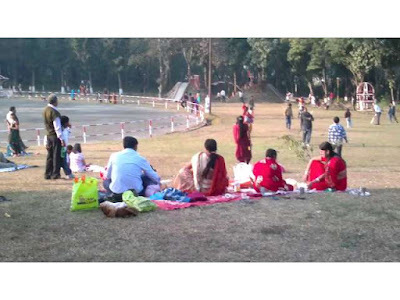 Park is a place where we can enjoy and have a good time with our family and friends. I visited a park with my family in the month of spring. It was a very pleasant day and I had lots of fun by playing near the seesaw. While we were entering the park we were given pamphlets which contained information as to why this park was built and it was written that "This park is built in the memory of Mary who loved parks and greenery". Mary was the president's daughter. Then, later on, my best friend also joined me in the park and we played together many fun games and had a jovial time. My mum prepared delicious sandwiches, salads and fruit juices. In the middle of the park, my friend Amy and I saw an arch which was decorated with carnations and creepers, it was looking extraordinary and we started taking pictures by standing near the arch. There was a beautiful pond nearby with ducks and frogs, it was a really beautiful scenery. The greenery in the park was very soothing to the eyes. We bought ice creams and popcorn to munch on. There was another large pond where we did boat riding, Amy and I were very excited to ride the boat. My family members also did boat riding which they enjoyed a lot. There were many beautiful flowers and plants in the park like roses, lilies, sunflowers, lotus, marigold, ferns etc.